Update 4/4/14: CVS now only accepts cash for vanilla reloads. CVS has been the go to store for Vanilla Reloads, ever since Office Depot and Walgreens have implemented a cash only policy. That doesn’t mean CVS is perfect. As with any store, they definitely have their issues. First, CVS is where almost EVERYONE goes to buy VRs, so it can occasionally be quite tricky to find them in stock. Another issue is CVS’s crazy rules. Every store seems to come up with their own set of rules, that are different from the national store policy. CVS 5 was an exception in this experiment, because it is not local. I just happened to be near it on week 3 and decided to pop in. The goal of this was to figure out a system for the VRC stock, however, what I figured out is there is no system. It is completely random. 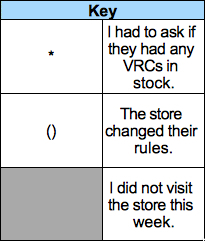 From talking with the clerks at CVS 3, I learned that they had not received VRCs in 3 months until week 5. There was no reason behind it either. I figured they didn’t realize the VRCs were out of stock so I asked if they scanned the barcode to order more and they had multiple times. Find out what day your local CVS stores get their shipments. That is the day you are most likely to find Vanilla Reloads. Most of my local CVS’ VRC stock is gone by Sunday. If they are out of stock on the VRCs, ask if they have any in the back. If not, ask if they can order some more. Keep checking your CVS stores, even if they have been out of stock for a while. Eventually, they will get more. Expect CVS to change their VRC rules. I will go more in-depth on this in a minute. Want to learn more about Vanilla Reloads? Check out this post. CVS stores are known for making up their own rules when it comes to Vanilla Reloads. The national CVS chain policy says that you are allowed to purchase $5,000 worth of VRCs per 24 hour rolling period. They keep track of this by scanning your ID after $1,000. So you could buy more than $5,000 if you stay under $1,000 per transaction. This is the national CVS chain policy and each CVS store tends to make up a few more of their own rules. I have been buying VRCs for awhile now and I did not have an issue at any of my local CVS stores for awhile. Then, out of the blue one of the stores changed their policy to cash only for VRCs. Their excuse was that every store is supposed to be cash only, but no one enforces it. Frankly, that is not true. The actual CVS policy raised the VRC limit from $1,000 to $5,000 a day back in August 2013. Another store recently changed their policy to $2,000 max a day instead of $5,000. Where they got these ideas, I don’t know. Don’t give up. Manufactured spending requires you to keep trying even when something doesn’t work. The store policy will change between cashiers, stores, shifts, ect. Don’t argue with the cashier. Simply, try again later with a different cashier or try a new store. You could also talk with a manager, but be polite. You won’t get anywhere if you start arguing with them. You want to make friends in this game, not enemies. Don’t take policies as fact. The fact is the CVS store policy says you can buy $5,000 a day, but stores tend to make up their own ideas for the store policy. Whatever happens at your local CVS stores, just know that even if they ban VRCs with a credit card (which they won’t), there will always be a way to manufactured spend. Always.